The dragon is the largest known flying creature. To maintain its enormous bulk in the air, its physical structure has to be different from that of other reptiles. ~The Western dragon (Eudraco magnificus occidentalis) has a sturdy skeleton structure. Large head, long neck, broad shoulders, thick legs, strong tail, and very large wings. The dragon's bones are very strong, but hollow and light; much like a bird. A dragon's jaw is large to accommodate the very strong muscles around it. The dragon is able to dislocate its jaw, as some snakes are able to do, to grab large objects. 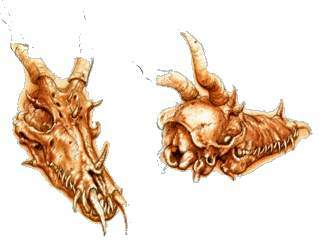 The dragon has two types of teeth becausee it is omnivorous (It eats meat and plants). The canine and incisor teeth of a dragon are long and razor sharp, but also have molars to chew their food instead of eating it whole. Dragons have an extraordinary articulatory system unknown in other species. The shoulder bones are thick to handle the large wing muscles needed to fly. The wing "finger" bones are very long to wrap the thin flight membrane taut around them. ~The Oriental or Eastern dragon (Dracoserpens Lung orientalis) has a extremely long, thin skeleton structure. It has a medium sized head, very long neck, short legs, small hips, and a long tail. This skeleton is very maneuverable because of the shape, such as a long snake is. It can twist and turn its body in all sorts of ways. 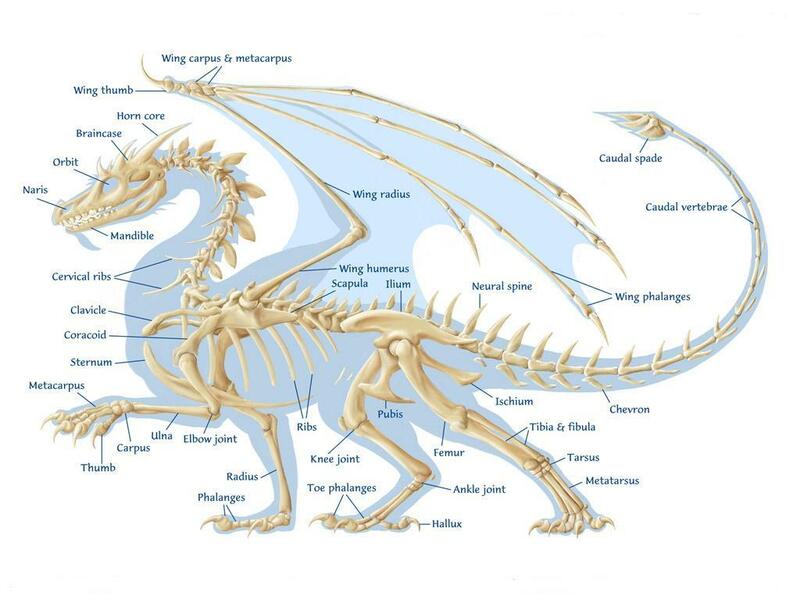 This type of dragon does not have hollow bones, and the dragon's skeleton is thin because it doesn't need the mass to accommodate flight muscles. This dragon does not have any type of wings as it flies with earth-magic verses brute strength.